Our young boy Elangeni How It Feels (Howie) was awarded 2nd in 6-12 Months Sweeps Stakes and Dog Challenge at, Nowra District Kennel Club Inc. under Mr T Valli (NSW.) Howie is super sweet and we are so pleased with all the wonderful comments we received on how well he Shows with Emma. Yet another fantastic weekend for our Swedish Superstar International SWD DAN FIN NORD NORW FRN LITH LATV Ch. Elangeni BraveheartRules (Eros)! On Saturday Eros took out Best in Group under Ms N Karlsdotter (Sweden) and on Sunday he followed it up by winning yet again Best in Group under Mr V Manuel Veiga (Portugal) at, The Double International Dog Show Gotland. We are so proud, though not surprised, at the strength and consistency with which our dogs perform under countless International Judges from around the globe. A true testament to their fantastic conformation, movement and type. With the results of this weekend, from both Australia and Sweden, being only more evidence of this. Another year, another fun filled 3 days at the annual, Dogs NSW Purina International Spring Fair, one of Australia's largest and most prestigious Shows. We had a great weekend filled with lots of fun, laughs and love. The dogs performed well and were consistently awarded, as always. We are pleased to intorduce our two new babies, now almost 6 months old, they are - our girl Elangeni Come On Over (Taxi) and Elangeni Come Fly With Me (Frankie) living in France. We are looking forward to watching them grow and develop. We are very excited to introduce our exceptionally handsome International Calendar Boy Ch. Elangeni Pink Floyd (Floyd.) 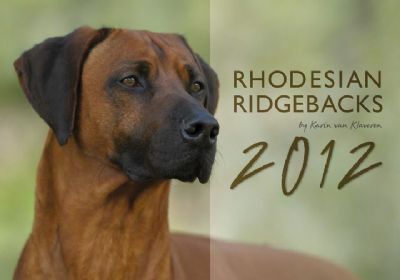 Floyd will be gracing the cover of the 2012 Rhodesian Ridgeback calendar by Karin van Klaveren. This collection of fantastic photographs is sold all over Europe. Big congratulations to Margaret and Elangeni Sole Man (Hunta) who obtained his Australian Championship and won Best Junior in Show today at, Gladstone Show Society Inc. under Mrs C Speed (QLD.) Hunta is Elangeni's 26th Homebred Australian Champion. Below is Hunta being stacked by Renee Davies. Elangeni How It Feels (Howie) was awarded 1st in Puppy Dog and Best Puppy Of Breed at, The Junior Kennel Club Of NSW under Mr C Fernandez Renau (Spain.) Howie shows exceptionally well for Emma and we are looking forward to watching this lovely young dog develop. 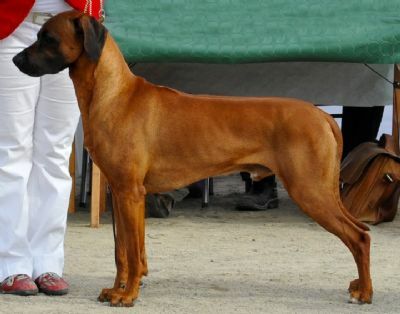 At, the 2011 Swedish Rhodesian Ridgeback Specialty Show. This is Eros's second Best in Show Specialty - it is also Elangeni's second Best in Show Specialty in 2011. The highlight of this win is that all of Elangeni were there to see it happen! Be sure to check our Travel Reports page for more information on our awesome trip. We are also thrilled to announce that Eros obtained his 7th Championship Title - he is now a French Champion! Australian can now lay claim to only 2 French Champion RRs - we are proud to say that both were bred by Elangeni. 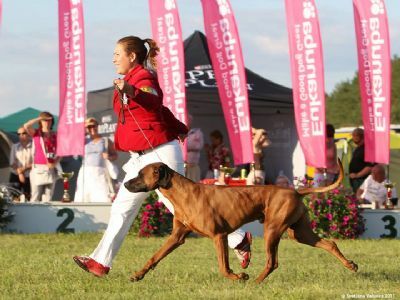 With the Shows Eros attended, in multiple countries, being either Major International Shows or Major National Shows, he is certainly proving himself to be a World Class competitor and a fantastic Ridgeback. We are so thrilled International SWD DAN FIN NORD NORW FRN Ch. Elangeni Braveheart Rules! See you soon! 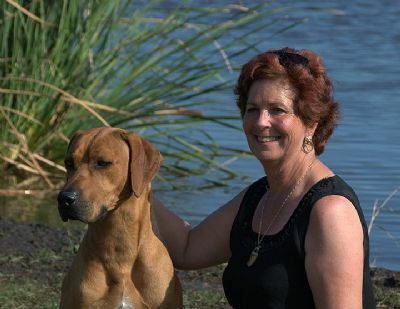 Linda and Emma had a lovely 4 day trip with Toni up to the Brisbane Rhodesian Ridgeback Specialty Show, Judged by Breed Specialist Mr J Coppens (Netherlands.) Our young Elangeni How It Feels (Howard) was awarded Best Minor Puppy in Show and his Daddy Grand Ch. 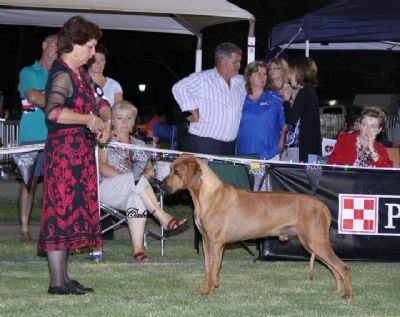 Elangeni Dream Run (Duke) was awarded his 10th Specialty 1st Place and Best Opposite Australian Bred in Show. We returned today with Duke, Evie, Floyd and Pearl to, The Purina Sydney Royal Easter Show for the prestigious General Specials Day - and what a day it was! We are absolutley thrilled to announce that Elangeni was awarded Best Breeder Team in Hound Group! This is the second time that Elangeni has achieved this amazing award having also won it in 2009. 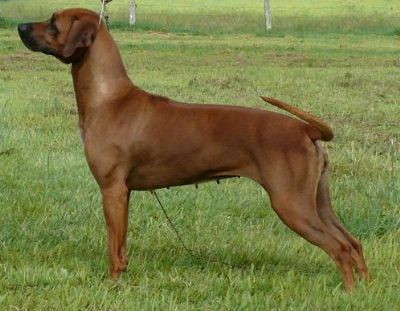 Elangeni is the only Rhodesian Ridgeback Kennel to have been awarded Multiple Best Breeder Team in Hound Group at The Purina Sydney Royal Easter Show. Thank you to Toni and Leigh for being part of the Team (we couldn't have done it without you! ), to everyone for their congratulations and compliments and to the Judge for recognising the quality of our beautiful, world class dogs. Here's to another Royal Win! It was another fantastic year for Elangeni at, The Purina Sydeny Royal Easter Show under Mrs S Lex (Canada) with every Elangeni dog exhibited being awarded at least a class placing! 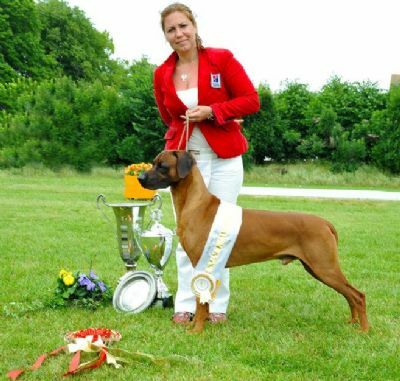 Elangeni was also awarded Best Ridgeback Breeder Team and later Best Breeder Team of the Day! Huge thanks to everyone for entering and exhibiting their Elangeni dogs with such pride and confidence. Elangeni is proud to annouce that today the lovely Elangeni Natural Pearl (Pearl) was awarded Best of Breed at, Bulli District Kennel Club Inc. under Mrs J Aspinall (VIC.) This win gave Pearl the final points towards her Title making her, at only 14 months, Elangeni's 25th Homebred Australian Champion! We are so proud of Pearl and Leigh and look forward to watching them grow and develop even more together as a Team. 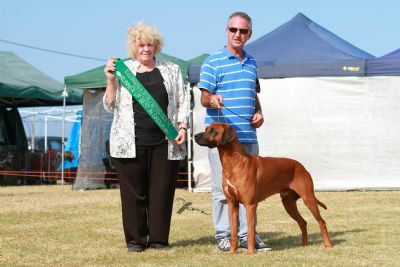 At, The Rhodesian Ridgeback Club of Victoria 25th Championship Specialty Show. This is Duke's FOURTH Specialty Best in Show and FIFTH Challenge Dog! We are thrilled beyond words by the achievements of this magnificent, and young, dog. Special thanks and congratulations to Toni for the outstanding Team that she and Duke make - we love you both! We had a fantastic weekend away at Newcastle at, The Lake District Canine Club All Breeds Champ Shows with great results and awesome company - big thanks to the Rhodepark gang for all their help! We had three Shows this weekend right on the beach at, Wollongong District Kennel Club Inc. - the dogs enjoyed swimming and running when they weren't in the Ring! Exciting news from Belgium! FRN Ch. Elangeni Lion OutOf Africa (Garry) was awarded Best of Breed with the Belgium CAC and International CACIB under Mr S Wheeler (Australia.) He was then awarded his third Best in Group under Mr J Dupas (France) at, The Mouscron International Show. We can't wait to see what else Garry will do in 2011! Huge thanks and congratulations to Vicki and her girl Elangeni She Rocks (Rush) for becoming Elangeni's 24th Australian Champion! Rush attained her Championship with 2 lovely Best of Breed wins. Here are some great new pics of Rush - the Happy Stacker! We are so proud of our special boy Gr Ch. 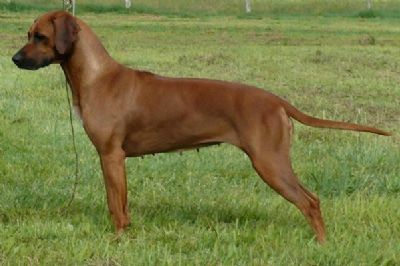 Elangeni Dream Run (Duke) who was invited to compete at the prestigious NSW Show Dog Of The Year - every dog exhibited had been awarded either an All Breeds Best in Show or a Specialty Best in Show at Championship Level in 2010. We were thrilled when Duke was cut to The TOP 25 Dogs in NSW! 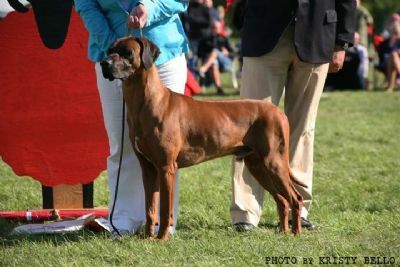 With an entry of close to 100 quality dogs, Duke was the only RR exhibited - he and Toni showed to perfection and were beautiful to watch.